MouthPeace by MooseLabs is an awesome attachment for when you’re smoking with friends, at an event and sharing glass or are sick and don’t want to infect others! 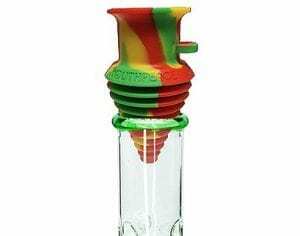 It can be placed inside the chamber of your water pipe or bong so that your mouth is not touching the glass. It can also be used as a roach holder or gas mask attachment! MooseLabs has also created a slim line version of MouthPeace as well as a “mini” version so it is compatible with all shapes and sizes of glass! All options are available in several colors and styles to fit your personality. Pick a MouthPeace that fits your pipe and your budget! If you’ve ever smoked out of glass, we all know that scary sound when you put it down a little harder than you expected. The imminent death of your glass is on most peoples mind while passing, putting down, or moving. BaseSavers by DividerPro not only eliminates the false alarm, but protects the bottom of your glass with a silicone cushion to alleviate the worry. They offer several different sizes and colors to accommodate the array of sizes in glass and your style. BaseSavers is made out of food-grade silicone, is easy to clean and also helps grip your glass to the surface it is placed on to reduce falling! BaseSavers range from $6.00-$15.00 and is a no-brainer for anyone smoking bongs on the regular. DividerPro is a monster in the industry, consistently putting out the smoker’s essentials while staying true to their origins in specializing in food-grade silicone products. Smoking glass=cleaning glass and I have found no better solution for those hard to reach spots than the Scrubber Duckys. For $14.95 you get the whole starter kit that comes with 3 magnetic Scrubber Duckys and the magnetic handle. Simply add warm water or your preferred cleaning solution, drop a ducky in the solution in the bottom of your glass, use the magnetic handle on the outside of your base to guide the ducky to where it needs to be scrubbed. Within minutes the hard to reach, resin-infested areas are looking shiny and new. I don’t know about you, but there have been plenty of times I’ve spent 45 minutes to an hour trying to clean my glass to perfection and even then it’s not always 100% clean. Ever since the Scrubber Duckys have been in my life I have saved time, headaches and stay getting compliments on my bongs! Res Caps are without a doubt a MUST-HAVE! Also made out of silicone, the Res Caps fit snugly around all your bong’s openings to assist in cleaning or containing the stench while you’re mobile. Before Res Caps I was cleaning my pieces over the sink with Saran wrap over the holes with rubber bands tied around them to help with leakage while I was shaking with alcohol and salt. Some times it worked, but most of the time it didn’t. Well, I have since been upgraded from my ghetto cleaning routine and now am worry free when giving my glass a bath. Who wouldn’t pay $11.99 + free shipping to have their cleaning experience significantly improved. 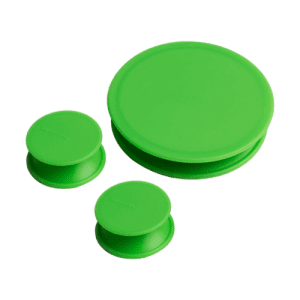 Res Caps are offered in green, gray and white and are universal- so they fit virtually any size pipe. Now I can freshen up my bong while cleaning/shaking in one hand a joint in the other. Full disclosure, we are the inventors of Bong Buddy. With that being said, we wouldn’t have released it if it wasn’t able to make the cut for the essentials. 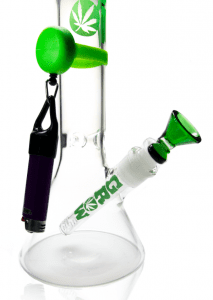 There are a few options when it comes to lighter holder for bongs, but after a ton of research and customer contact, we developed the best solution. Bong Buddy is the elastic, retractable, glass safe bong lighter holder. It fits virtually all water pipes and is made of high grade silicone. Bong Buddy eliminates lost lighters and prevents lighter thieves. All of the other options on the available currently require you to put the lighter back or re-attach it. Wasn’t that the problem to start with? You’re Netflix & chillen by yourself the lighter disappears in the the couch cushion or you misplace it. If you’re having a sesh with friends, we all know that person who always forgets to pass the lighter with the piece or pockets it when they leave. Now your lighter is attached to Bong Buddy, which is attached to your bong! There’s no pocketing, forgetting, losing, or having to get up and search the cushions. How much have you spent in lost lighters? I know I have spent a small fortune on replacing them. So, for $7.99 + free US shipping, we created the only real solution. Stay tuned for more articles on the industry, products, news and events! This article was not endorsed by any products or companies presented. This article is based solely on our opinion. Comment on this post with any feedback or experiences you’ve had with any of the products/companies listed!